Valerie Landau is currently Assistant Professor of Multimedia Design at California State University, Monterey Bay in the School of Information Technology and Communication Design. She also taught at San Francisco State University, Ohlone College and Universidad Nacional Autonoma de Nicaragua. 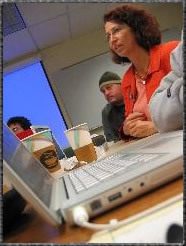 Valerie works with computer visionary Dr. Douglas Engelbart on developing an Educational Networked Improvement Community to study and design hypermedia projects in conjunction with students and scholars from around the world. An Invitation to Innovation an Interactive Time Line, by Student Teresa Barsante. Requires Flash Player. Field Trip to Engelbart's Home, photo essay by student Charles Spidell. Valerie Landau produced a series video taped oral histories from prominent Silicon Valley pioneers about the impact Douglas Engelbart had on their work. Student Rebecca Sheranian developed an online video archive using xml, Macromedia Flash, and QuickTime. Reflections on Engelbart: Online Video Oral Histories. Requires Flash Player. Video Tour of Casa Sobrantes, by students Michelle Lawlor and Sherri Ruggeri for the Parks and Recreation Department to make this historic home accessible to people with disabilities by creating a video-based tour. Requires Flash Player. These Spinning Blocks are a refined version from original experimentation with clickable spinning blocks in a project called What is Multimedia by a student who works under the name of Zaft. Requires the Shockwave Player. Students are encouraged to work on useful educational projects. Student Nan Edmonton collaborated with Nutrition Professor Betty Clamp to create this tutorial for a nutrition class. It features an animation about the Krebs Cycle, Osmosis, and Fat Accumulation. Nutrition tutorial requires the Shockwave Plugin. Instructor Diane Wang developed HTML: Web Publishing Tools as an online course while enrolled in Valerie Landau's course Developing An Effective Online Course and she teamed up with student Ron to create this tutorial on Cascading Style Sheets and Ice Cream Shoppe. Requires the Shockwave Plugin. HTML: Web Publishing Tools, was developed by Diane Wang while she was enrolled in Developing an Online Course.